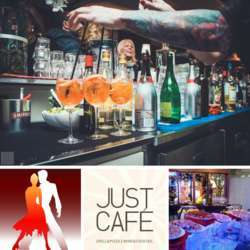 Join us at Just Café, another classic aperitif venue in the center of Lugano. The cool gang of InterNations will be waiting for you to catch up, introduce fellow expats and help you make new acquaintances. From 22:00 we can all go to the disco "La Cantina" below the bar to dance the night away to Latin beats. This central location can be easily reached by bus and it's close to many parking facilities, so no excuses! Register by 16:00 of the day of the event. Feel free to bring friends, but if they want the CHF 5.- discount, please ask them to become InterNations' Members, and then to sign-up for this event, in order to be on the guest list. There is no way of being on the guest list without an InterNations membership. The guest list doesn't process "+1", so, when not on the list, the fee shown on "not signed up for event" will apply.